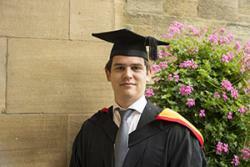 A Romanian student who was awarded £1,000 for his participation in extracurricular activities has further cause for celebration this week as he graduates with a First Class degree. Bogdan Pop, from Cluj Napoca in Romania, picked up the Santander Excellence in Enterprise award earlier this year in recognition of his outstanding commitment to enterprise and innovation activities throughout his time at Bangor. Some of those activities include nationwide competitions such as the IBM Universities Business Challenge, FLUX and the Bloomberg Investment Competition, as well as university-run events like market fairs and Enterprise by Design. Now, 22-year-old Bogdan has replicated this success in the classroom, by gaining a First Class degree in Management with Banking and Finance. But the academic qualification is not the only thing he has to show for his time at Bangor.